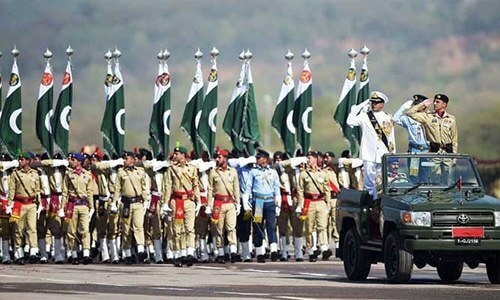 ISLAMABAD: March 23, 2019- The nation is observing Pakistan Day today with a renewed pledge to make Pakistan a developed and progressive country with a strong defence. Contingents of Pakistan Armed Forces marched past the dais presenting salute to the chief guest and the guest of honor. The president thanked the Malaysian prime minister, Azerbaijan’s defence minister, the chief of Bahrain’s armed forces and other foreign dignitaries for gracing the parade with their presence and participating in the Pakistan Day celebrations. Formations of fighter jets of the Pakistan Air Force, Turkish and Chinese air forces presented breathtaking aerobatic maneuvers spreading a range of colors in the skies. Paratroopers from Pakistan Army, Air Force and Navy demonstrated marvelous free fall. There was also similar demonstration by the paratroopers from Saudi Arabia, Azerbaijan, Sri Lanka, Bahrain and Brunai. Floats depicting culture of Azad Kashmir, Gilgit Baltistan and the four provinces added colour to the celebrations. Prime Minister Imran Khan, Defence Minister Pervez Khattak, Chairman Joint Chiefs of Staff Committee General Zubair Mehmood Hayat, Services Chiefs witnessed the parade. Malaysian Prime Minister Mahathir Mohamad was the guest of honor of the parade. A graceful change of guards ceremony was held at Mazar-e-Iqbal in Lahore on Saturday morning in connection with Pakistan Day. A smartly turned out contingent of Pakistan Air Force assumed guards’ durty at the Mazar. Base Commander of PAF, Air Commodore Syed Sabahat Hassan, who was chief guest on this occasion, laid floral wreath on behalf of Chief of the Air Staff, Pakistan Air Force and People of Pakistan. He also offered Fateha and recorded impressions in the visitors’ book. Sindh Governor Imran Ismail and Chief Minister Syed Murad Ali Shah along with the cabinet members visited the mausoleum of Quaid-e-Azam Mohammad Ali Jinnah. They laid floral wreaths at the Mazar and offered fateha and paid tribute to the great leader for untiring efforts that paved the way of acquiring a separate homeland for the Muslims of Sub-Continent. Speaking on the occasion, they said that the day requires us to renew our resolve to work for country’s stability, unity and progress. In Khuber Pakhtunkhwa, Main function in connection with Pakistan Day was held in Peshawar. Governor Khyber Pakhtunkhwa Shah Farman was chief guest on the occasion. He gave awards to distinguished personalities. Khwaja Safar Ali was awarded Tamgha-e-Imtiaz for his services in Handicrafts Art. Cricketer Yasir Shah was given Sitara-e-Imtiaz for his extraordinary performance in cricket. People of Balochistan, including those of provincial capital Quetta are also celebrating Pakistan Day with full national enthusiasm today. In this connection a music concert is going to be held at Polo Ground in Quetta Cantt under the auspices of Pak Army tonight. Popular singers will perform at the music concert. The Quetta Gladiators, the winning team of PSL season four, has specially been invited to participate in the music concert. Pakistan Day is also being celebrated in Gilgit Baltistan with national zeal on Saturday. In this connection an award distribution ceremony was held in Governor House Gilgit where Raja Jalal Hussain Maqpoon conferred awards on behalf of President of Pakistan. Our Gilgit correspondent sher Muhammad reports that ceremonies were held in Ghizer, Hunza, Nagar Diamer, Astore and Baltistan division. An investiture ceremony will also be held at Aiwan-e-Sadar in the evening where the President will confer civil awards on individuals demonstrating feats in different fields of science and arts. Different organizations and societies have also arranged functions and ceremonies to commemorate the day and inculcate a spirit for progress, prosperity and defense of the country.